I have just been playing with Mocha VNC Lite for the ipodtouch. Its dead easy to get it to work. I downloaded Real VNC Free Edition and started the server on one of my PC’s. The VNC Client connects straight away. Unfortunately the Lite version doesn’t have mouse, function key, return or arrow keys, these are reserved for the “pay for” version, I hope they have arrow key support since I tried to use it to run Second Life and Neverwinter Nights. Both of these need the arrow keys. 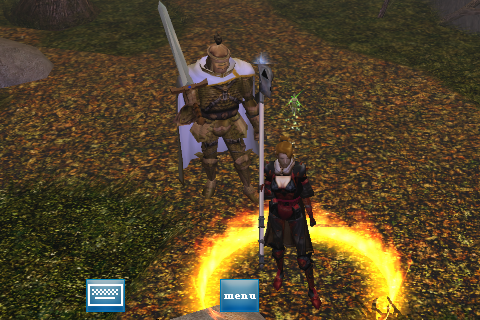 I took a picture of the Neverwinter Nights screen on the ipod, [here’s how] but you’ll have to take my word for it since it could be any old screen shot, the ‘touch doesn’t record a camera type for flickr. I have done all this behind my firewall. I’ll be experimenting with doing this over the internet some time. You might like to check the following links; Mocha VNC’s FAQ and User Guide. I also found that the logical size of the PC screen was too large for the VNC client and I got a ‘window’ on the screen. I wonder if this can be fixed. This is the picture as taken on the ipodtouch, which renders larger than the ‘touch’s screen as an image and hence also in the the HTML view. I have left the picture as sized here, but other images in this blog I have re-sized to be closer to the real screen size.